Confession: I spend most of the summer quietly mumbling about the humidity and the mosquitos, longing for the cool breezes of autumn. Just as the moisture leaves the air and a crisp air rolls through is exactly when I leave my air conditioning hibernation and want to spend time lounging outside. Fall is fast approaching, so it seems like the perfect time to share some tips on how to extend your patio life for best time of year to actually enjoy it! Since we got to design the country cottage patio from scratch (see the full before and after post here), lots of fall friendly elements were incorporated into this space so it makes the perfect example to illustrate. Layout When selecting and laying out outdoor furniture, think about how you really use the space. Do you spend most of you time gathered around a table enjoying a good meal or do you focus more on lounging? For example we knew lounging would be priority #1 so we created this patio space with a conversation area featuring cedar adirondack chairs all facing each other and the firepit. Directly behind it sits a zone for relaxing in a hammock as well as eating dinner at a picnic table in the grass. Creating these zones make for great entertaining flow and function. 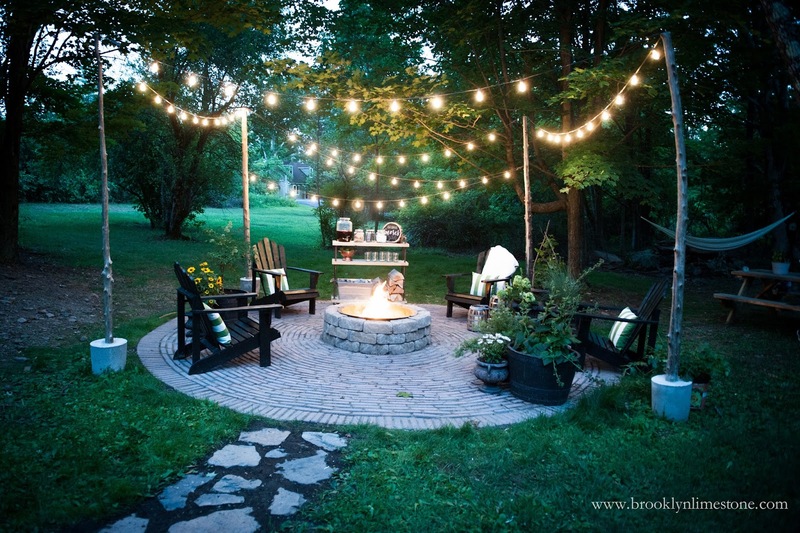 Lighting With the long daylight hours of summer fading fast, you'll need to think about how to best light your outdoor space once the sun goes down. Whether eating meals with the whole family or just enjoying a glass of wine out back, you'll want to be able to see after sunset. There are endless options but some of the easiest to install as well as most beautiful to look at are simple string lights. Since we wanted to be able to move them as needed, we strung these Allen + Roth White Plug in String Lights from cedar branches set in cement bases but you could easily hang them from trees, a garage or a deck. Their soft glow not only serves the function of lighting the patio but also makes for a great celebratory decoration when entertaining. You can compliment the main lighting with ambient lighting accents like lanterns and candles. Fire There are few things more primal or more entertaining than starting a raging fire. Enter the firepit - an activity that never seems to get old for our group no matter what the temperature. Not only does it keep everyone warm and toasty during a chilly night but gathering sticks and lighting it ablaze becomes a party in of itself with everyone lending a hand. When the fire is roaring, everyone can gather around for some sweet s'mores. We used this Flagstone Firepit Patio Block Kit to build this one and it works beautifully with the brick patio and was easy to install. Serve This patio was built with friends and family in mind so having a spot to serve treats for young and old alike was key. Instead of a fixed piece of furniture, we used lumber, plumbing supply pipes and casters to build a moveable feasting cart. Used here as a s'mores bar, we outfitted it with jars of chocolate, graham crackers and marshmallows, lots of firewood and some apple cranberry cider wash it all down. 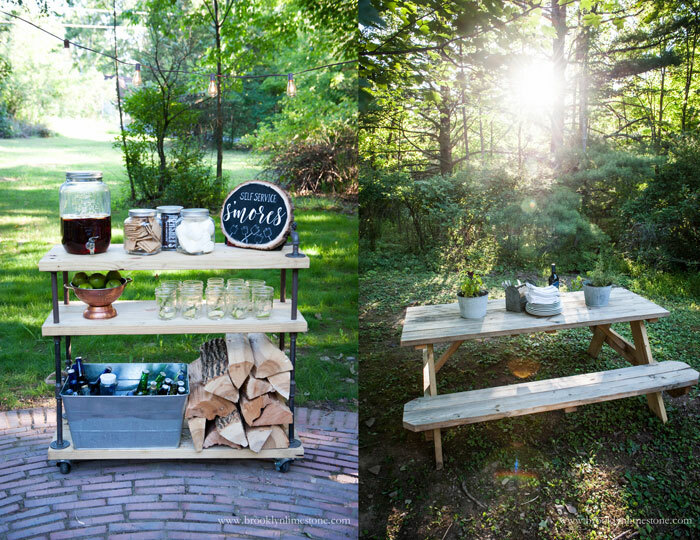 For different occasions, it can easily be used indoors or out as a rustic bar cart, firewood caddy or bbq food prep bar. We also situated this wooden picnic table just off the side of the patio to serve as separate seating and serving space to use as needed. Cozy Once all the key elements are in place, don't forget to add a few cozy touches to make our outdoor space feel just as comfortable as your indoor. Outdoor striped pillows were used in each chair for both color and comfort. Add a few throw blankets (these can be the regular indoor kind, just be sure to bring them in after the evening is over) to snuggle under for extra warmth. 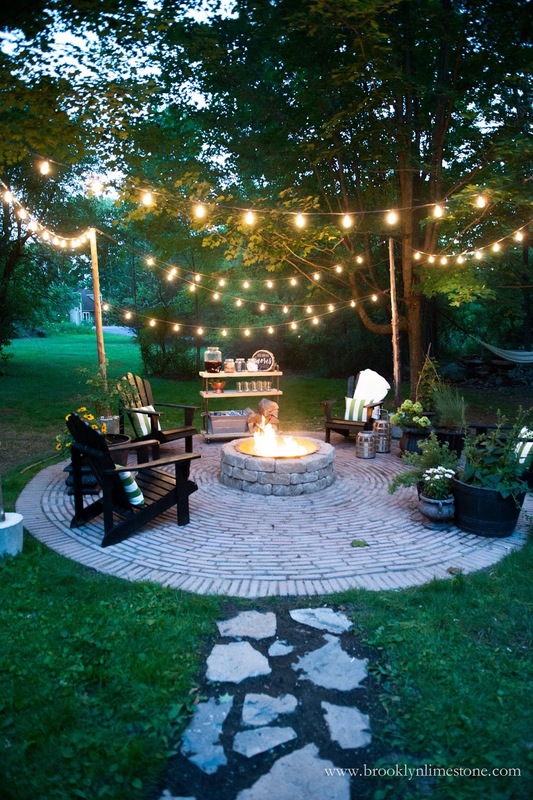 There are so many ways to make the most of your outdoor space this fall - those were just a few of them. How many days til the start of fall? Disclosure: This post is written in partnership with Lowe's Home Improvement.  Thanks to them and all my sponsors who help make the projects you see on Brooklyn Limestone a reality. As always, all opinions expressed are my own. Hi Stefanie! Stopping in from the Home + DIY Bloggers Biz Chat FB group. I love how your backyard patio came together - what like a lovely place to enjoy the cooler weather of Fall that is sure to come. As for me, I'm in no hurry to let go of summer - I don't mind the heat. Fall is nice but I dread the thought of Winter! Thanks Jeanie! I'm so ready for more pleasant temps but I'm not looking forward to short days. Such a magical spot! 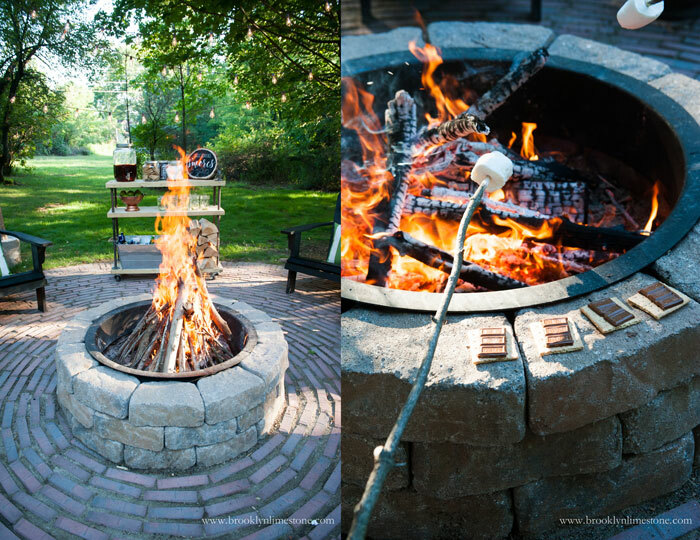 I adore your brickwork and hello, my bar cart needs to be repurposed into a s'more cart. So genius. Nice work!!! Hi! I saw this post on our DIY Bloggers FB group and glad I did! 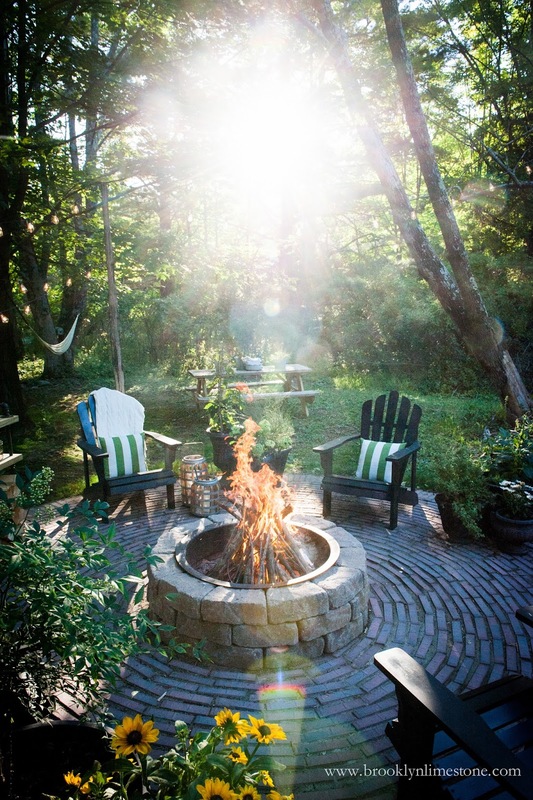 My hubby just put in a similar fire pit, but stopped there. I love what you've put together here and gives us great inspiration for how we'll finish our area. Thanks for sharing! Just happens that bats are my animal to help this fall. Doing so by trying to find 100 people to put up bat houses on their properties. Bats vacuum the night sky of insects consuming about 600 bugs per hour! I have about 40 people committed to putting up bat houses this fall. I have 60 more to go. If you read this, please consider this. They start at about $20 on Amazon. Please check it out. It also helps save bees and helps us to not use those deadly insect sprays that are killing off bees by the millions.